Since 1970, Earth Day has celebrated our earth, putting environmental concerns on the front page and raising public awareness about living organisms, the environment and links between pollution and public health. 2018 marks the 48th anniversary of Earth Day, April 22; the date never changes. However, since our earth is changing, Earth Day channels the energy of many individuals and companies to make sure that change is going to be for the better! Many businesses, like ePromos, wish to use the coverage surrounding the day to launch sustainable and environmentally-friendly initiatives, such as Earth Day giveaways with eco-friendly promotional items. While we all know that a commitment to sustainability goes beyond going green one day a year, Earth Day is the perfect opportunity to remind customers, coworkers and community of your commitment to the cause through Earth Day promotions. Here are 20 creative Earth Day giveaway ideas for your company to share your concern for the environment. Inspiring Earth Day giveaway ideas and products for your customers, community, company and coworkers. 1. Create a team to lead the company’s eco-efforts and determine where you can have the biggest impact for the least amount of money. As a thank you gift for this team’s dedication, and as a great Earth Day giveaway, give them a memorable eco promotional item to save, a globe-shaped bank with your company’s Earth Day Mission imprinted on the bank. 2. Do you have a small team of employees? Consider branding you team members in reflective gear and Adopt-A-Highway! It’s a great time to strengthen relationships within teams while doing something good for the earth – and, the added bonus is that your organization’s name gets exposure within the community! 3. Share your company’s green tactics on social media so your community knows you are eco-aware. For Facebook followers who “like” your Earth Day intelligence, give away a fun and goofy globe pen that reminds “social likes” to keep our planet clean. Online business can share green tips on their website and incorporate their own products and services into those tips. 4. Choose an eco-friendly activity or a project for your company that can be repeated year after year. Lock up the paper coffee mugs for a week or month and replace them with branded mugs they’ll wash and use throughout that time period. Or maybe set up group walks during lunchtime to just smell the fresh air and catch up with co-workers. The point is, get the company to recognize Earth Day and participate in the initiative in some way. 5. Is your company primarily an online one? Add some festive Earth Day elements to the branding on your website and social media profiles for the day or days leading up to Earth Day to show your support. 6. For inside the office: purchase sensor lights for breakrooms and conference rooms and request that your cleaning company use environmentally friendly, non-toxic cleaning supplies. Most importantly for companies: have fun celebrating Earth Day! 7. For considerable exposure and publicity, your company can initiate a “Green Award” for customers making big strides to improve our planet. Highlight their efforts in an Earth Day press release and give them a gift engraved with your logo. Really want to make an impression? This Globe Award is a special one. For the runners up: custom planters to grow their own herbs either at home or at the office. 8. During the week before Earth Day, advertise a brown bag lunch and learn session around how individuals can play a significant role in protecting our world. Your company can also rollout internal recycling programs during this time. Attendees should be presented with a gift of participation. May we suggest a reusable lunch tote! 9. Instead of offering discounts on your products and services, add value to their transaction by offering a gift with purchase. Promote Earth’s wellness using an Earth Day giveaway consisting of seeds and a planter to grow flowers and herbs; a promotional gift that has longevity AND it’s good for the earth. 10. Kids are the perfect Earth Day target audience for your company, and their parents tend to tag along. Looking for a great Earth Day activity for kids? Order these notebooks made of apple peels (they smell like it too!) and invite the children of customers to create a story (with illustrations of course) about Earth Day. Consider also providing logoed crayons and complimentary adult coloring books to say thank you. 11. A simple reminder for customers to unplug appliances will go a long way ecologically speaking. Many individuals don’t know that appliances still draw power, even when not in use. Or, encourage them to use a “smart” power strip that senses when appliances are off and cuts “phantom” or “vampire” energy use. Always encourage customers to get outside! Go for a hike, toss around a beach ball at the pool, or play some disc golf and give them a start with a customized flyer! 12. Put collection jars, imprinted with your company’s Earth Day symbol, throughout your office. Proceeds from the jars can be donated to an environmental foundation in honor of Earth Day. Make sure your customer sees one of your donation jars to give them an opportunity to contribute to a great cause. 13. Water is vital and so is your team. Staying hydrated is important, but bottled water is not the answer. Gift your coworkers with compostable mugs, reusable tumblers and sports water bottles to quench their thirst and to save the environment. In addition, consider purchasing a water cooler. 14. A final note for your coworkers: use a recycled sticky note clipped to a recycled pen with your company’s logo to remind them to shut down their computers at the end of the day, turn off the water faucet while scrubbing their hands, refrain from using personal heaters and fans in their offices and turn off workstation lights when not in use. 15. Touch your community in other ways including planting trees, lobbying your local government to increase spending on sidewalks and bike lanes to use for “green” transportation, and publicly challenge other businesses to incorporate eco-friendly business practices. Have them join the endeavor by sending them a Sunflower-in-a-Can. Announce the contest and rules with a full-color imprint right on the can. 16. Connect with the community by sponsoring a recycling drive. This event will give your entire community a chance to properly dispose of old computers, electronics and more. 17. Showcase your commitment to a healthy planet by publishing your paperless policy and handing out a real tree keychain. This simple gesture will let the community know your company is striving to go as paperless as possible. Going totally paperless may not be reasonable, but that doesn’t mean you can’t reduce the amount of paper your company uses by simply using both sides of every sheet of paper. 18. Earth Day 5k races, parades and community cleanup activities – your company’s participation in these events will speak volumes about your commitment to the environment. So, gather your team, give them Earth Day themed apparel and head to the starting line to run or go to the park and pick up trash. Feel free to invite your top customers to join in these efforts. Videotape these adventures and save the footage. For Earth Day, create a video using that footage and share on social media. You could call enough attention to your company to sustain your business for the rest of the year. What a great way to get your brand in front of local customers! 19. Want to really impress your community? Promote your company’s Earth Day promotions on postcards printed on biodegradable seed paper that grows plants. The key is to creatively showcase both your business and your environmental efforts. 20. Your Earth Day efforts don’t have to be expensive to be effective. Giving away cost-conscious items like reusable tote bags, water bottles and plastic bags is always a good idea. ePromos has more ideas to reflect your environmental responsibility. Your company can educate consumers on the impact one can make with earth-aware choices made on a day-to-day basis. Call a Brand Consultant to discover exceptional Earth Day giveaway ideas, fun office tips, merchandise made of recyclable materials and Earth Day items that can be sent in 24 hours. Earth Day is only one day, yet the challenges of climate change and diminishing natural resources are our responsibility throughout the year. Business owners have a unique opportunity to take a dedicated stance on sustainability and engage others about environmental causes through Earth Day giveaways. Call us, the Promo Know-How People and plan for your company’s Earth Day Promotions now! Interested in reading more on Earth Day? 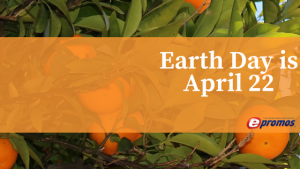 Behind The Scenes: Earth Day at ePromos! Plan Ahead: Earth Day is 1 Month Away!